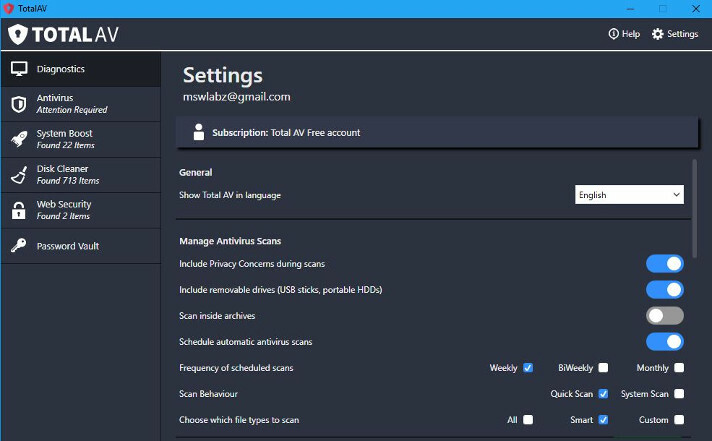 TotalAV is a new Windows antivirus software that not only finds malicious programs but also removes useless and duplicate files on the PC. It ships with a password manager and a VPN tool. The security software is available for download on Windows, Mac, Android, and IOS operating system. If you found TotalAV on the web while searching for a free antivirus program, read our review of TotalAV to learn whether the newly launched security software is worth installing or not. When you run the installer tool of TotalAV, the program extracts some files in the C Drive. Then, it opens a small window that displays an option to log in to your TotalAV account or register a new account. The users must register their account to use this program. Once the account is registered, TotalAV downloads virus definition updates and some files from the web. Once the program downloads the required files, it loads the Antivirus engine and opens the main interface. Then, the program initiates a quick scan operation. The Quick Scanner utility of TotalAV scans the important folders in the file system to find files infected by viruses, malware or trojan. The first time scan lasts for 10 to 20 minutes. You cannot pause or resume the quick scan task. The only way to stop the scan is to close the program. Once the program finishes scanning your PC, it will run the disk space and system booster utility. It will also run a special scan to find the web security issues on your machine. During the file scanning task, TotalAV found tracking cookies on my laptop and it displayed an option to remove them. The program didn’t remove the junk files nor did it make changes to the OS configuration to improve its performance. I compared the junk file statistics of TotalAV with that of CCleaner. According to CCleaner, my laptop has 1.6 GB junk files. TotalAV found just 4.7 MB junk data on my device. Antivirus: In this interface, you’ll find options to run Quick or Full System system and enable real-time protection. This section allows users to see and manage files that TotalAV has isolated (quarantined). Free users are not allowed to turn on the real-time protection module and add files to Quarantine. The Pro version of TA costs $19.9. System Boost: There are 100s of powerful tune-up utilities available on the web. Although most the programs are free, there are some paid tune-up programs which claim to offer more features than the freeware applications. If you’re using TotalAV, you don’t have to download third-party tune-up program. The free antivirus software has a built-in system booster module. Glary Utilities and Slimware Utilities SlimCleaner are widely used programs. If you don’t find the System Boost tool of TotalAV reliable or useful, you can use one of these two programs. Disc Cleaner: TotaAV can find duplicate files on your computer. It can also locate junk files on your machine. Web security: The PC security software has a built-in VPN and an option to manage Windows Firewall from its interface. It has VPN servers in 10+ different locations. The antivirus software also includes an AdBlocker utility. The three tools aren’t available to the free users. Password Vault: I didn’t give a try to the password vault feature of TotalAV because I’m using KeePass. I scanned a USB drive with TotalAV, the program found 12 viruses. Kaspersky found 33 viruses on the same drive. The TotalAV’s settings interface boasts option to change the interface language, schedule scans, enable or disable scanning files in an external storage device, compressed files, etc. The user interface is clean and bug-free. Quarantine and Real-time protection is a paid feature in TotalAV. Junk cleaner is not as powerful as CCleaner. Conclusion: TotalAV is a well-designed program, but most of its features are locked. It found some viruses on my pen drive and tracking cookies on my PC. The free version of Kaspersky Antivirus does a great job of protecting the PC. Most importantly, it doesn’t have unnecessary features such as a VPN, Junk Cleaner, etc. Hence, if you don’t like TotalAV, use Kaspersky. TotalAV's free edition has limited features, but its premium version has many features. The program's user interface is beautiful and easy to use. Next articleTenor D vs Redmi 5A: Which 2GB RAM 4G phone you should buy?